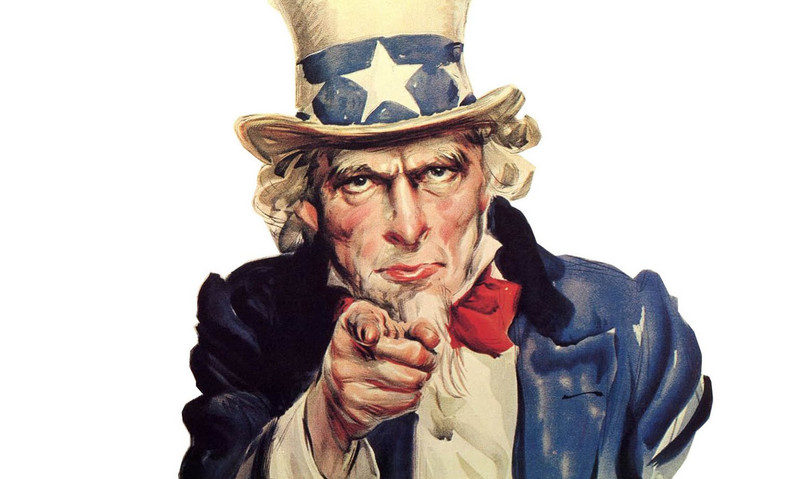 You there! Did you know that you already own several of my books? Open up your favourite e-reader or e-book application and go right ahead. Put in Jeremy Tyrrell into the search bar and go for it. Download and share to your heart’s content. Wait, are you with Amazon? Well, that might pose a problem. The problem is this: Amazon refuses to allow me to make my books free. I physically cannot, in the little price editor thing that they’ve got, set it to zero or blank or null. In fact, I cannot set it for anything less that 99 cents. That’s their business model, and, if I wish to distribute with them, I need to follow suit. Fair enough. It’s their platform. Their ones and zeroes. Thing is, my book is my ones and zeroes, and they should be yours, too. Sure, you can download the .mobi format from the Smashwords site for free, I don’t know how that plays with adding it to your account, or whether you can share it, or if it goes from device to device or what. And, really, why should you, the reader, pay for something that everyone else gets for free, simply because of the carrier? The solution, I found the other day, is that Amazon will honour competitor’s prices. So, for example, if I were to post one book on iTunes for $5, and on Amazon for $6, Amazon will, wisely, match the $5 price tag (same currency). The only thing you, as a reader, need to do is inform Amazon of the cheaper price. 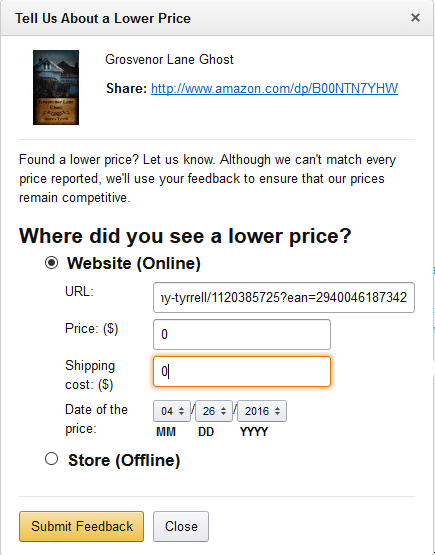 Above the ‘Author Info’ and below the ‘Product Details’ is a little option to ‘tell us about a lower price’. To do this, you need to be on the .com website, not the .com.au. It’s not there for some reason. Don’t know, don’t care. And put in 0 for the price and shipping, click Submit Feedback and Bob’s your uncle.It says Thank you for your feedback, and the dialog goes away. I think that it is a manual process to validate, but, I assume, once they’ve approved that it is indeed cheaper at Barnes and Noble, they’ll let you have it for free. Go nuts with Jolimont Street Ghost, and Atlas, Broken. And Adaptation. You can find the links to them in the side bar of this website. Boom. Thank you. The books are yours. Please enjoy them with my compliments and gratitude. 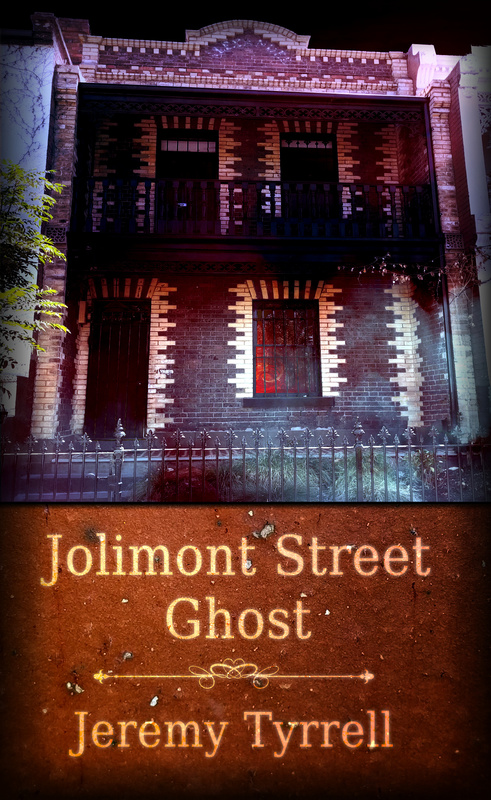 Jolimont Street Ghost – Free at last! Tada! 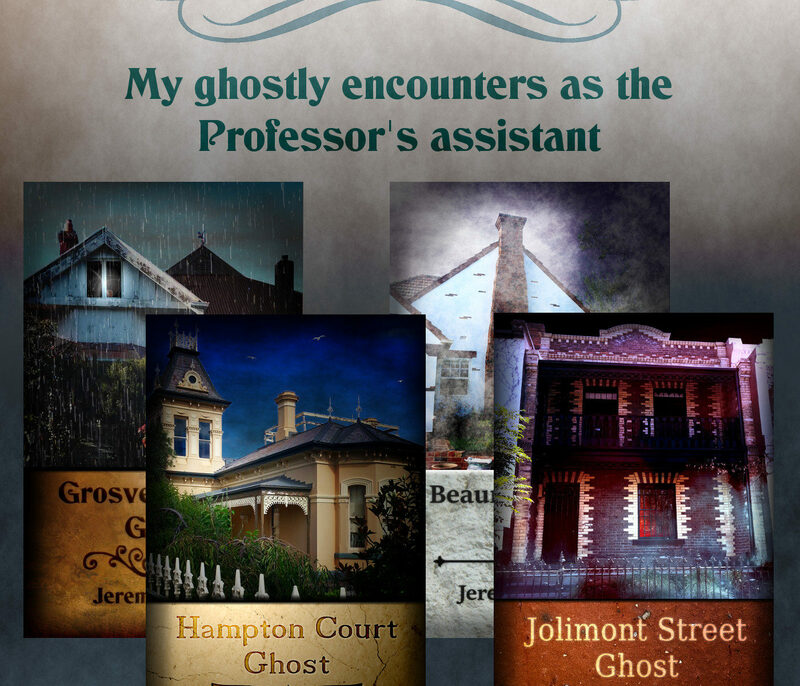 Please find Jolimont Street Ghost at Smashwords, yours for free, with my compliments, in whatever format you like. Cue the fireworks and open the champagne. OK, maybe I’ll just crack a beer and watch Hellboy. You see, I wanted to hold off on the release until I had all my ducks in a row. I wanted it available in printed media, as well as on Google Play and Amazon, get the webpage up, and all of that stuff, but I, um, kind of mucked up the delay thing at Smashwords and, well, long story short: it’s out. It’ll be up on Barnes and Noble, Amazon, Google Play, iTunes and Kobo in a day or two, and I’ll update the website accordingly, but why wait? Head to Smashwords and bag yourself a free copy now! (Besides, it ain’t gonna be free on Amazon).